- List 1, List 2 or List 3? - Add 1, Add 2, Add 3 or Add 4? - Delete 1, Delete 2, Delete 3 or Erase 1? - Update 1, Update 2, Update 3 or Update 4? - Link 1, List 2 or Multi 2? - Multi 1, Multi 3 or Multi 4? For a definition of the underlying motivation behind this article please refer to What are Transaction Patterns? The structure - an XSL stylesheet which defines what the transaction's output will look like when it is rendered into HTML. The behaviour - a Transaction Pattern (Controller) script which defines what the transaction does, what operations it will perform. The content is supplied from one or more of the components which exist in the business layer. Each different pattern has its own controller script, but several controllers are able to share the same XSL stylesheet. Each user transaction in the application will have its own Component script which will identify which pattern (controller and view) is to be executed on which database table (model). The purpose of this document is to describe the various templates/patterns which currently exist in my software library. 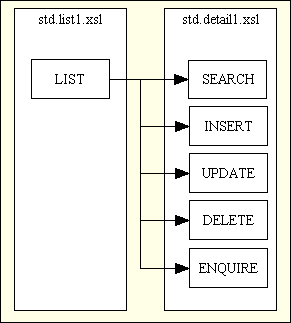 In order to create a user transaction from a pattern it is first necessary to import the structure of your application database into the Data Dictionary, then export each table definition to provide a class file which will be used as the Model in the Model-View-Controller design pattern. In the following sections each database table and its associated class file may be referred to as an "entity". While most of the following patterns deal with a single entity there are some which deal with two or more. Rather than have large complex components which can perform several functions I much prefer to build small simple components which perform a single function each. While this does increase the number of components within an application it also increases the amount of reusable code which results in faster development times. Thus to maintain the contents of a typical database table where I need to provide the functions to list, search, insert, update, enquire and delete I create a family of components which is arranged in the structure shown in Figure 1. Note: each of the boxes in the above diagram is a clickable link. 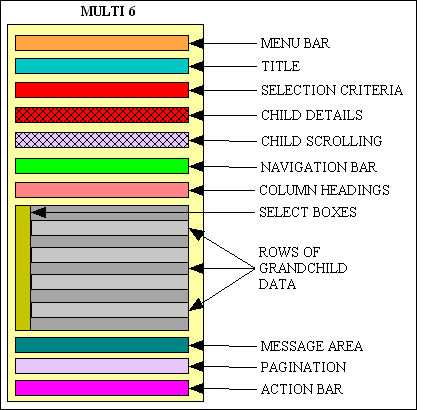 In this structure the LIST (parent) component is the only one that is available on a menu bar - all the other child components can only be selected from the navigation bar within a suitable parent component. In most cases the child component will need the primary key of an occurrence in the parent component before it can load any data on which it is supposed to act. In this case the required occurrence in the parent screen must be marked as selected using the relevant checkbox before the link/button for the child component is pressed. It should be noted that in my web development environment all HTML output is produced by XSL transformations using XML files created by the Dialog Type scripts. Each component will therefore require its own Component script to specify the content as well as an XSL file to display that content. Another area of reuse I have managed to achieve is for several components to share the same XSL file, as shown in Figure 2. 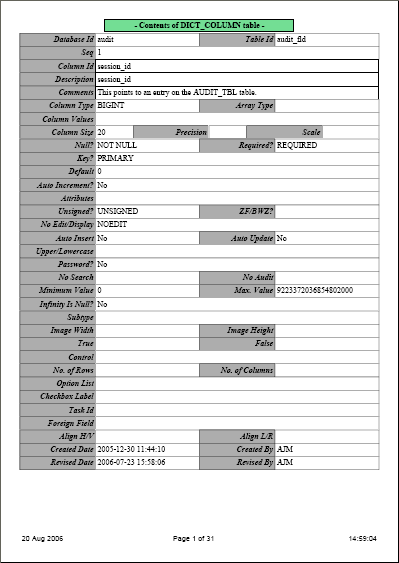 The parent screen (LIST) shows data for multiple database occurrences in summary form, with each occurrence taking up one line going across the screen with one set of column headings at the top. 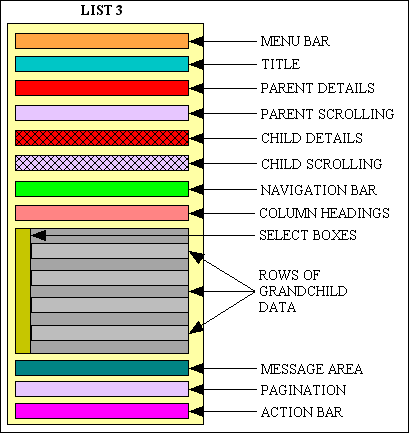 The child screens (SEARCH, INSERT, UPDATE, DELETE and ENQUIRE) shows data for a single database occurrence in detail form going down the screen, with a label in front of each field. 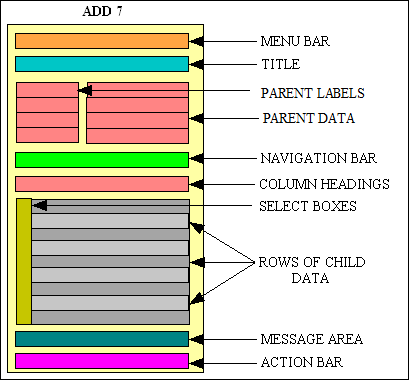 As the child screens have an identical structure they can all share the same XSL file. In my original infrastructure each database table required its own version of the list.xsl and detail.xsl files as the table, field names and field labels had to be hard-coded inside them, but I have since enhanced my XSL library so that a small number of generic stylesheets can be used for any number of database tables. This is documented in Reusable XSL Stylesheets and Templates and uses updated versions of my std.list1.xsl and std.detail1.xsl stylesheets which allow the table name(s), field names and field labels to be passed in as part of the XML data. The following sections contain references to the screen area. This is the area within the browser window running on the client device which the software may fill with data. It must be remembered that each client may have a different screen resolution, so that what fits easily into a screen at one resolution may need scroll bars in another. It must also be remembered that users may alter their browser's font size which may also affect how much data can be displayed without the need for scroll bars. It is not possible to dictate either the screen resolution or the font size used by individual clients, nor is it practicable to limit the amount of data generated by individual forms to fit the smallest screen window that may be encountered. What is important is to output enough data to make each screen usable based on the average screen resolution and default font size that are currently in use. On some clients this may leave areas of empty space while on others it will overflow the available area and require the use of scroll bars. This is a fact of life which cannot be avoided. add to favourites - this will add the current task and its menu bar to the favourites area of the Menu/Home Page. When one of these favourites is selected the task will be activated with its menu bar reconstituted to the saved values. logout - this will cancel the current session, log the user out and return to the LOGIN screen. logout (all) - this will cancel all sessions which may currently be open on the client device (see Appendix H for details), log the user out and return to the LOGIN screen. new session - this will generate a new session name with a new session id for maintaining session data on the server. This is useful after creating a cloned browser instance which would otherwise share the same session data as the original instance. See Appendix H for details. print - this will cause the current page to be redisplayed without any menu buttons, navigation buttons, action buttons, pagination or scrolling areas, thus enabling it to be printed through your browser's print facility without being cluttered with unwanted details. This hyperlink will then change to 'noprint', which, when pressed, will return the page to its previous state. help - this will invoke the online help facility for the current screen. The ability to change the text into images is documented in FAQ99. The middle row is the current set of menu options. If you click an option which is a sub-menu then the whole list of options will change. If you click an option which is not a menu then the whole area below the menu bar will change to reflect the requirements of that option. The background colour of that option in the menu bar will then change to be the same as the second row to signify that it is 'active'. The other options will have a different background color to signify that they are 'inactive'. The bottom row of the menu bar will trace the route from the starting page to the current page. This list is sometimes known as 'breadcrumbs' as it allows the user to find his way home if he gets lost. As each new task is selected it will be added to the list. When a task is terminated it will be removed from this list. An item in this list will be available as a hyperlink if it is different from the current page. A dropdown list which contains a selection of column/field names. A text box into which your search criteria can be entered. If you select a field name from the dropdown list, enter a value into the text box, then press the SEARCH button, this will cause the task to retrieve data which matches this search criteria and refresh the screen display with the first page of available data. 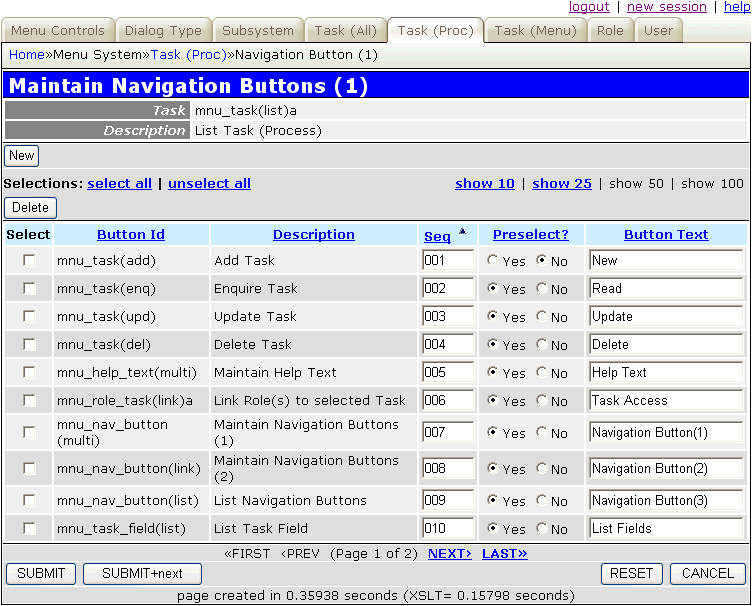 Navigation buttons are defined on the NAV_BUTTON table within the MENU database. They are shown as a series of buttons in an area immediately below the Title & QuickSearch Bar. They are similar to menu buttons in that they pass control to other tasks within the system, but as each parent task has its own set of navigation buttons for child tasks, it is possible to pass context from the parent to the child task. NEW This will bring up a blank detail screen which will allow a new occurrence of the current entity to be added to the database. SEARCH This will bring up a detail screen which will allow a variety of selection criteria to be defined so that the number of rows retrieved from the database can be reduced. PREVIOUS SEARCH If search criteria has already been defined for the current database table then this button will activate that search criteria. Upon returning from a SEARCH screen the page number will be reset to 1, and any column sorting settings will be cleared. New data will be retrieved from the database using the search criteria, and will be presented in the default sort sequence starting at page 1. READ This will bring up a detail screen which will show all current data for a single database occurrence. This will be 'read' only. UPDATE This will bring up a detail screen which will show all current data for a single database occurrence and allow that data to be amended. 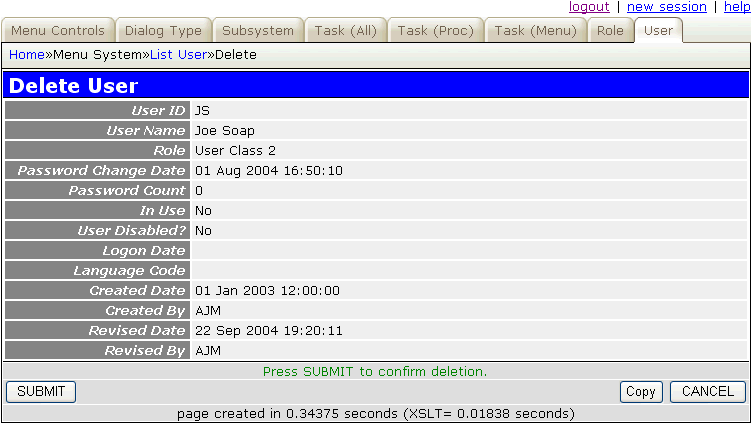 DELETE This will bring up a detail screen which will show all current data for a single database occurrence. This will have a 'submit' button which will cause that occurrence to be deleted. <other> This will bring up another child screen which contains data from other database tables which are related to the selected occurrence. This selection process enables the primary key(s) of the selected occurrence(s) to be passed down to the child form so that they know which occurrences to process. Upon returning from a child function the parent function will re-retrieve its data according to the current settings (page number, sort sequence, etc). 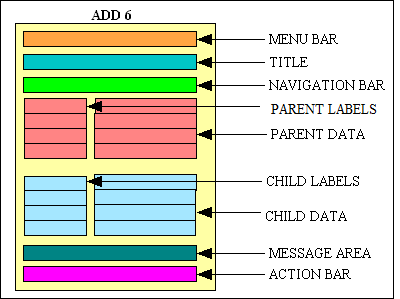 This is so that any changes made by the child function can be included in the screen display. select all This will set all the selection checkboxes for all rows in the current screen to ON. This option is not available when the SELECT column contains radio buttons as only a single selection can be made. unselect all This will set all the selection checkboxes for all rows in the current screen to OFF. This option is not available when the SELECT column contains radio buttons as only a single selection can be made. locked If this checkbox is set to ON it will cause the selection to be locked so that when returning to the screen the selected records will be automatically re-selected. This is done by storing the primary keys of the selected rows, so that when the screen is rebuilt any row in the display which has a stored primary key will have its selection checkbox set to ON. By default this is OFF, which means that selections are not saved. This is a global setting, which means that it is either ON or OFF for all screens, not just the current screen. show nn This will alter the number of rows that will be displayed in each 'page'. Be warned that the larger the number the longer it will take for the page to load, and the more scrolling you will have to do to reach the action buttons. These options are not available if the page size cannot be altered. (of nn) This is the total number of rows available with the current search criteria. If the number of available rows is not 2 or more then the column headings will be shown as plain text, not hyperlinks, as there will be no point in sorting only 1 row. If one of these hyperlinks is pressed it will cause the current page to be regenerated after the data is sorted on the selected column. Note that this causes all data which satisfies the current selection criteria to be sorted, not just the data on the current page. An image will appear next to the column heading to indicate that the data has been sorted on this column. If this or any other such hyperlink is pressed again it will cause the sort sequence to alternate between ascending and descending, with the image next to the heading being switched accordingly. Any column sorting can be cleared by using the RESET button in the action bar. The way that data is displayed in this area depends on whether it is capable of displaying single or multiple occurrences (rows). The data for a single occurrence will be displayed vertically, with labels on the left and data on the right. For functions which allow inserts or updates an asterisk in front of a label is used to indicate that the field cannot be left empty. If there is an error with the user's input a suitable error message will be shown immediately under the offending data. For details on how these different layouts can be specified please refer to XSL Structure files in The Model-View-Controller (MVC) Design Pattern for PHP. The data will be displayed horizontally, one occurrence per line. Alternate rows will be shown with a different background colour to help them stand out from each other. 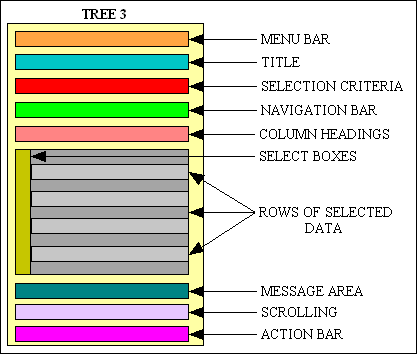 For functions of type LIST, MULTI 2, TREE VIEW 1 and TREE VIEW 2 these will be a method of selecting one or more occurrences before pressing one of the buttons in the navigation bar. This will cause the primary key of the selected occurrence(s) to be passed to the function which is associated with that navigation button. For functions of type POPUP these will be a method of selecting one or more occurrences before pressing the CHOOSE button in the action bar. This will cause the primary key of the selected occurrence(s) to be passed back to the previous function. For functions of type LINK 1 these will initially indicate if an occurrence of the link entity exists or not. By changing the setting of any select box and pressing the SUBMIT button on the action bar then the corresponding occurrence of the link entity will be created or deleted as appropriate. How can I make a single row in a multi-row area non-editable? How can I remove the select box from a single row? How can I hide/remove columns in a multi-row display? How can I modify column labels at runtime? How can I replace a column and its label at runtime? Messages related to a particular field will usually appear immediately below the field's data in the data area. There may be circumstances where there is a message which cannot be attached to any field on the current screen, or where there is a general message or instruction. In this case such messages (as there may be more than one) will appear immediately below the data area. In screens of type Delete 1, for example, this area will either display a confirmation message or it will give a reason why the record cannot be deleted. For some screens there may be more records available than can be displayed at any one time (see LIST 1 and LIST 2 for examples). In this case the number of available rows will be broken down into manageable 'pages' and a pagination area will be made available which will allow the user to move forwards and backwards through the available pages. The number of rows per 'page' is governed by a variable within the class for each database table, but this may be altered at run-time by choosing one of the options in the middle row of the navigation bar. 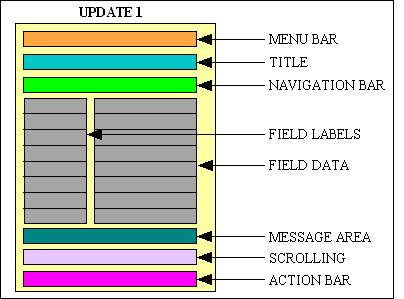 There are two display options which are available, governed by the Pagination Width setting on the Menu Control Record. If this value is zero then the default display will be used. If the value is greater than zero then a 'Google style' display will be used. «FIRST ‹PREV If the current page number is greater than 1 then these will be shown as hyperlinks which will cause the function to go back to either the FIRST or PREVIOUS page. Page X of Y (default display) Shows the current page number (X) and the total number of pages available (Y). Page A B C of Y (Google style display) Shows a number of entries for individual pages (A, B, C) and the total number of pages available (Y). The current page will be shown in bold while those either side will be hyperlinks. The number of pages either side of the current page will be governed by the value for Pagination Width on the Menu Control Record. NEXT› LAST» If the current page number is not the last then these will be shown as hyperlinks which will cause the function to go forward to either the NEXT or LAST page. There may be screens in which it is possible to step through a series of selected or available items (see Delete 1, Enquire 1, List 2, Multi 2 and Update 1 for examples) either as well as or instead of the usual pagination options. In this case there will need to be a separate area to control the movement between the selected/available items. This 'scrolling' will usually be for one occurrence (item) at a time rather than multiple occurrences, and will only be shown when multiple occurrences are actually available. 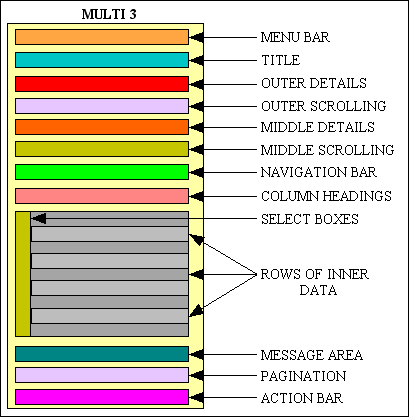 Note that there may be more than one scrolling area to a page (as in Multi 2), so each area will be placed immediately below the data to which it relates. There are two display options which are available, governed by the Scrolling Width setting on the Menu Control Record. If this value is zero then the default display will be used. «FIRST ‹PREV If the current item number is greater than 1 then these will be shown as hyperlinks which will cause the function to go back to either the FIRST or PREVIOUS item. 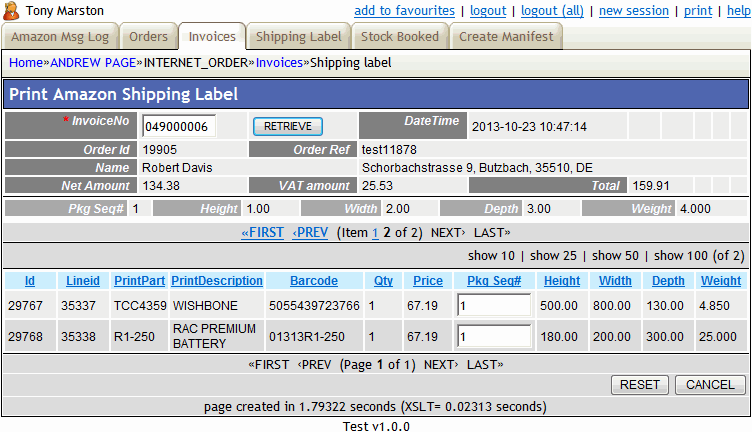 Item X of Y (default display) Shows the current item number (X) and the total number of items available (Y). Item A B C of Y (Google style display) Shows a number of entries for individual items (A, B, C) and the total number of items available (Y). The current item will be shown in bold while those either side will be hyperlinks. The maximum number of items either side of the current item will be governed by the value for Scrolling Width on the Menu Control Record. NEXT› LAST» If the current item number is not the last then these will be shown as hyperlinks which will cause the function to go forward to either the NEXT or LAST item. These buttons are defined within the controller script for each dialog type as they allow the user to choose an action which that controller is able to perform, such as updating the database, terminating the screen, or resetting the selection criteria. These buttons are situated in an area at the bottom of the screen. The SUBMIT button(s) will be on the left while any other buttons will be on the right. The number of buttons will vary according to the circumstances. CHOOSE After selecting one or more occurrences in the current screen, usually by setting a checkbox, this will pass the selection back to the previous screen for processing. CHOOSE NULL This will cause the current selection in the parent screen to be nullified or cleared. This is different from the 'Cancel' button which will terminate the popup process without making a selection, thus leaving any current selection unchanged. This option is not available in popups which allow multiple selections. RESET Reset any search, sort or page settings to their original values and re-retrieve the data as if the function were being started afresh. SUBMIT Attempt to update the database using the current data. If any errors are encountered a suitable error message will be displayed underneath the offending field. If there are no errors then control will be returned to the previous function. SUBMIT+stay Attempt to update the database using the current data. If any errors are encountered a suitable error message will be displayed underneath the offending field. If there are no errors then stay on the current record. SUBMIT+next Attempt to update the database using the current data. If any errors are encountered a suitable error message will be displayed underneath the offending field. If there are no errors then skip to the next record (if available). COPY Copy the current screen contents into memory so that it can be pasted into a subsequent screen. PASTE If data for the current database table has been copied into memory then this button will paste that data into the current screen. The text which appears underneath the action bar is described in Version Number. There may be several application subsystems running under the Radicore menu system, and it is sometimes useful to know the version number of each of those subsystems. This is now an optional feature which is activated by placing a file called version.txt in the subsystem directory. 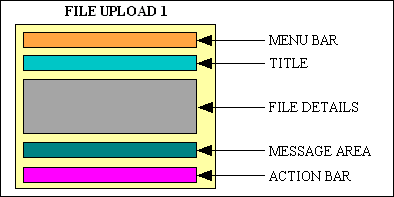 If such a file is found when running a script from within that subsystem then its contents will be retrieved and displayed at the bottom of the screen underneath the action bar. The contents of this file should be a text string of up to 40 characters. It is sometimes a requirement that an application is able to operate in more than one language. This can be a problem if all text, such as titles, labels and messages, is hard-coded within the application. It is far less of a problem if this text is maintained in separate text files as this gives the ability to modify the text in those files without modifying the application. Whenever the application requires a piece of text it uses an API which, when given the identity of the text and a language code, will retrieve that text in the required language and return it to the application. Create a new subdirectory for the required language code. Take an existing text file and translate the contents. Put the translated file into the new subdirectory. Obtaining the user's language code is simple in a web application. The user can define his/her preferred language in the browser settings, and this information is made available to the application on the server through the HTTP_ACCEPT_LANGUAGE variable. This is explained in more detail in Internationalisation and the Radicore Development Infrastructure (Part 1) and Part 2. This string will then be passed to the child table as the $where argument on the call to getData(). The same applies when passing control from one task to another by means of a navigation button. The primary key of the selected row(s) in the parent task will be extracted into a $where string and passed to the child task. 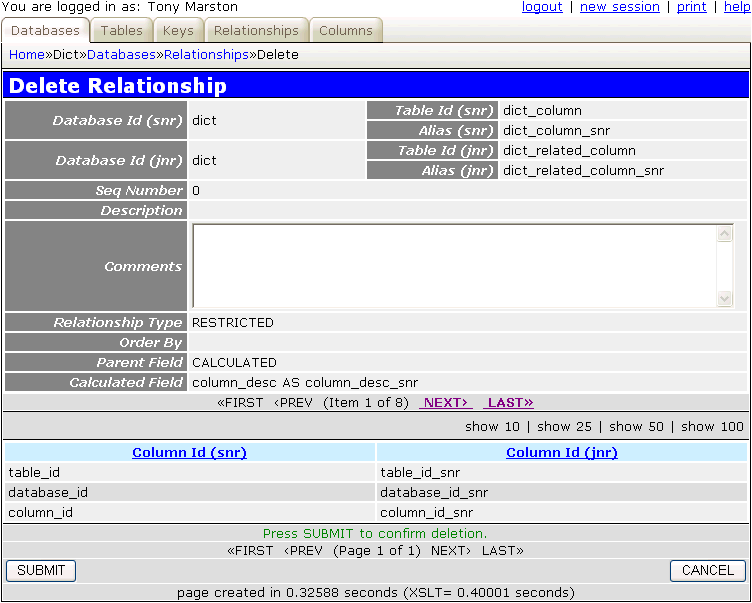 Note that although the $parent_relations array contains information regarding which fields are used in the relationship between two tables, or even where a table is related to itself, this is only used in the ON clause of a JOIN when that table object is asked to construct an sql SELECT statement prior to retrieving its own data. This information cannot be used to automatically translate field names in a WHERE string which is passed down from an external source as there is no information which identifies which of the many possible relationships is involved. These functions will enable the user to add new entries to the database. 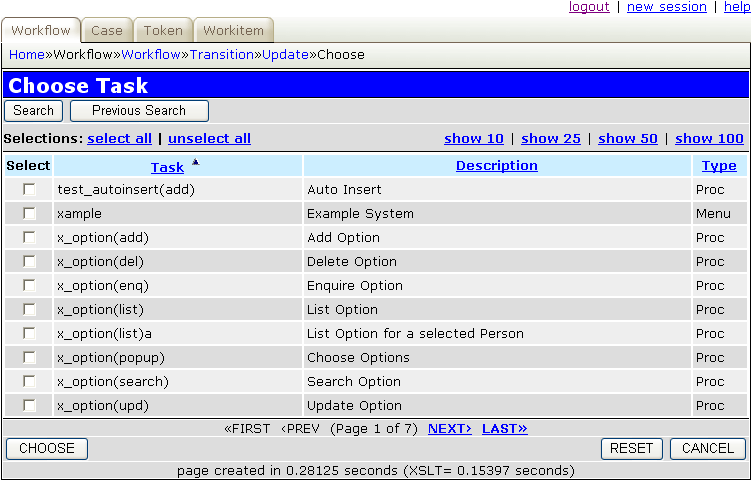 This is typically called from a LIST 1 task in order to add 1 new row at a time to the database. 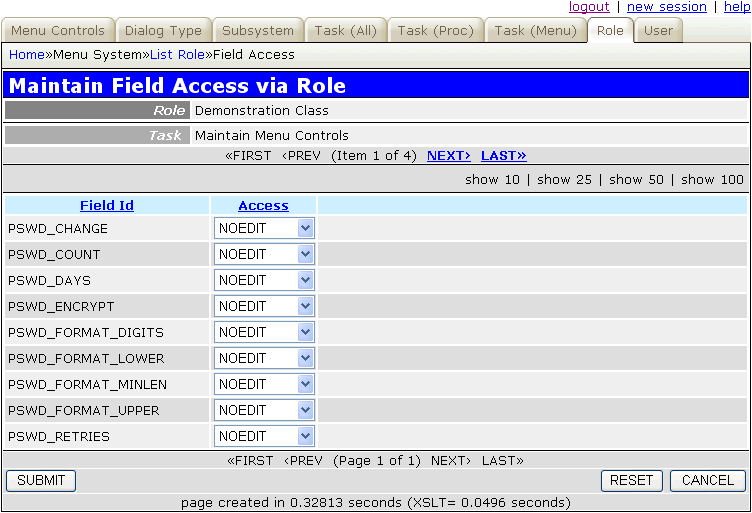 Upon initial entry this screen will usually be blank, but some fields may be shown with default or initial values. Menu bar This will show the menu options which led to this screen. Title This is supplied at runtime. Navigation Bar This is usually empty for this type of function. Data Area As this area is for a single occurrence the data will be shown vertically, one field per line, with data on the right and labels on the left. Message Area This will contain any messages or instructions. CANCEL - terminate the current function without performing any updates and return to the previous function. SUBMIT - submit all data to the database then return to the previous function. SUBMIT+stay - submit all data to the database, then initialise the screen ready for new input. Copy - copy the data to memory (this will allow it to be used by the PASTE function). 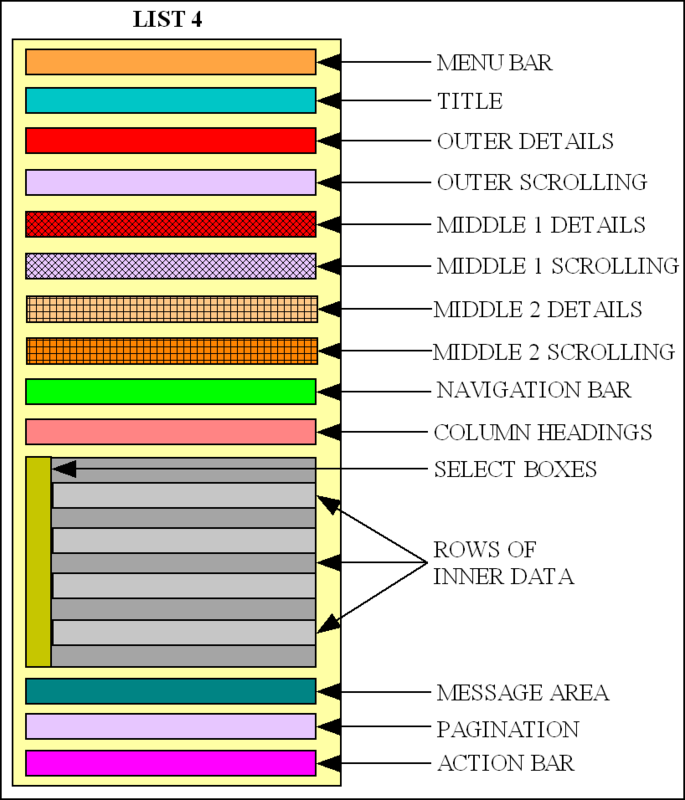 Paste - fill the screen with data from the memory area. 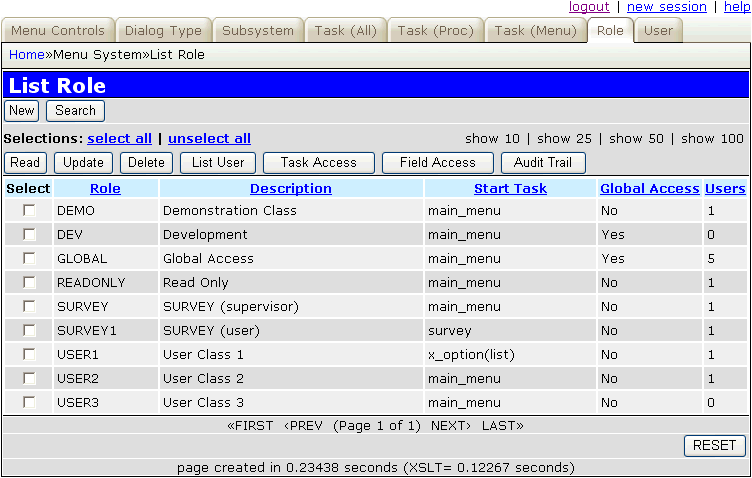 This screen has a similar layout to the ADD 1 screen, but is called from a LIST 2 task. Upon initial entry this screen will retrieve the parent details as identified in the previous function and show them as read-only at the top of the data area. The remaining details will usually be blank, but some fields may be shown with default or initial values. Parent Details These are details from the parent record as identified in the previous function. These cannot be amended. This function does not have a visible screen. It is used to add occurrences to the link entity which exists in the middle of a MANY-to-MANY relationship. This is called by a parent function which passes it the identity of an occurrence from one of the MANY tables. This function will then call a popup screen which will allow the user to select one or more occurrences from the second MANY table. This function will then use the identity from the first MANY table with the selection list from the second MANY table to add new occurrences to the intermediate link table (using multiple calls to the insertRecord() method). This process is represented in Figure 3. Note that in order to switch the popup screen from allowing you to choose a single occurrence (where the SELECT column contains multiple radio buttons), to choosing multiple occurrences (where the SELECT column contains multiple checkboxes) you must change the contents of the _cm_popupCall() method so that $settings['select_one'] is FALSE. This will also cause the CHOOSE NULL button to be removed from the popup screen. This function does not have a visible screen. It is used to add one or more occurrences to a database table using information passed down from the parent screen. This information is used in the getInitialDataMultiple() method to construct an array of entries which is then added to the database using the insertMultiple() method. Upon completion it will return control to the parent screen. Working examples can be found in the Data Dictionary subsystem with the Import Databases, Import Table and Import Columns functions. Note that the insertMultiple() method can also perform updates and deletes as well as inserts. This function allows several child occurrences to be added to a selected parent occurrence with a single input screen. Upon initial entry this task will retrieve the parent details as identified in the previous function and show them at the top of the data area. The contents of this area may be modifiable, or may be set to 'noedit'. A number of blank rows will be shown below the column headings in the child area which the user can fill in before pressing the submit button. By default the number of blank rows which is first displayed in the child area is determined by whatever code is in the getInitialDataMultiple() method. During the execution of the script it is possible to include custom buttons to add or remove rows from this area as documented in FAQ156. Note that the insertMultiple() method call also perform updates and deletes as well as inserts. Parent Details These are details from the parent record as identified in the previous function. These may be amended. Column Headings These will be plain headings, not hyperlinks, as the data does not yet exist on the database and therefore cannot be sorted. Data Area As this area is for multiple occurrences the data will be shown horizontally, one occurrence per line. 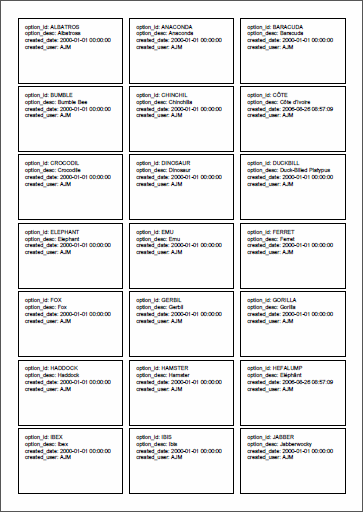 The number of blank rows available will be determined by the getInitialDataMultiple() method. The ability to add or delete rows dynamically may be added by following the procedure described in FAQ156. Where there are two tables in a parent-child relationship this function will allow a new record to be added to the parent table and a single record to be added to the child table in a single operation. 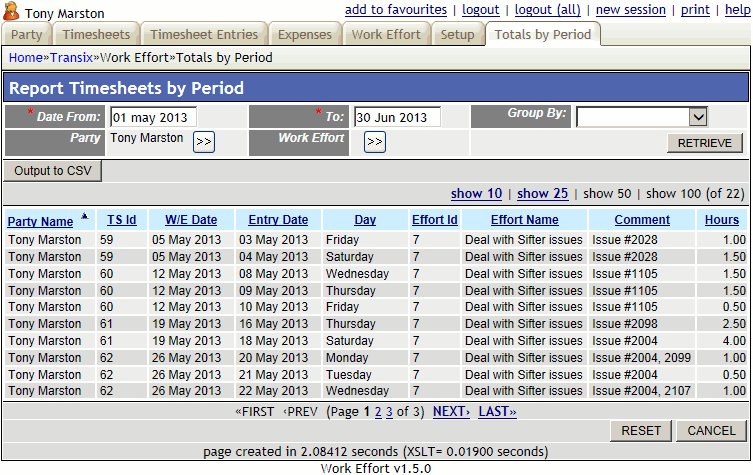 This avoids the need to have separate tasks to add records to each table. Parent Details As this area is for a single occurrence the data will be shown vertically, one field per line, with data on the right and labels on the left. Each field will initially be empty. Child Details As this area is for a single occurrence the data will be shown vertically, one field per line, with data on the right and labels on the left. Each field will initially be empty. This is similar to Add 6 but will allow multple entries to be added to the child table. All other patterns in this catalogue are for tasks which are run from within the web browser, but they must be completed within a time limit otherwise the processing will be aborted. If a script needs to run for a longer time one option is to run it from the command line in which case there is no time limit. See FAQ56 for details on how to set up a batch job. As well as via the command line, this type of job can also be initiated via a cron job which will run it at scheduled times. The current session data will be copied to a new session with a new session_id. A new entry will be created in this new session to hold the details of the task which is about to be initiated. The selection and sorting criteria used by the current task will be inserted into this new entry's details so that they will be available to the batch task. An HTTP request will be generated for the new task which will be run in a parallel process in the web browser. This request will be directed to use the new session data. This is achieved by using the CURL extension. This parallel process will not have a limit o its execution time, so will run until it finishes. After the parallel task has been initiated the current task will continue by automatically jumping to the Show Batch Log File screen. The user can either wait here until the output from the batch task appears, or continue working with other tasks. 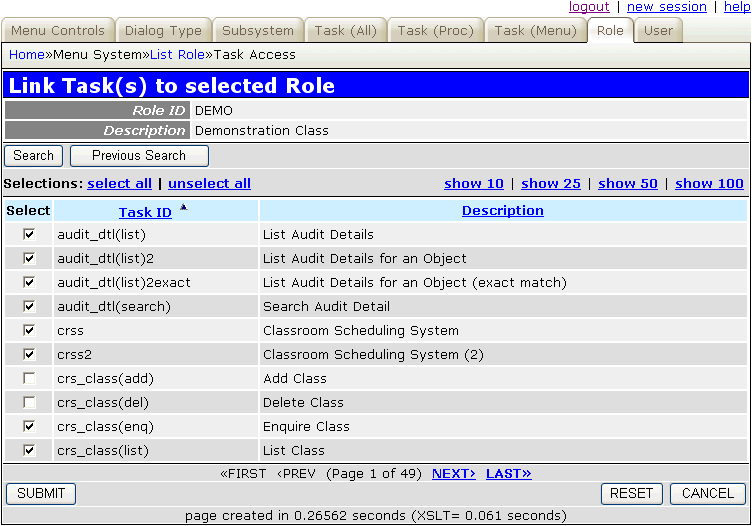 Note that this task cannot have any dialog with the user, although it is possible to pass it any selection and sorting criteria from the current task. These functions will enable the user to delete entries (or remove links to entries) from the database. Upon initial entry this function will retrieve a record from the database using the primary key(s) passed down by the previous form. It will then use the $child_relations array in the database object to check if any subordinate entries exist on any related database tables which will prevent the deletion from continuing. If there are any such constraints then an error message will be generated. Message Area This displays either the message "Press SUBMIT to confirm deletion" in order to give the user the opportunity to cancel/confirm the deletion, or it gives the reason why the record cannot be deleted. Scrolling Area This will provide options to scroll forwards and backwards through the selected items. CANCEL - terminate the current function without performing any delete and return to the previous function. SUBMIT - delete the current data from the database, then check if any subordinate entries exist on any related database tables. Using the contents of the $child_relations array in the database object it will either delete these occurrences or nullify the foreign key. It will then return to the previous function. This button will not be displayed if the record cannot be deleted. If it is necessary to prevent everyone except the record's creator from deleting the record this can be achieved by putting the string created_user=$logon_user_id into the SETTINGS field for the task. This function does not have any dialog with the user. It receives an array of primary keys which were selected in the previous form, deletes them one at a time using the deleteMultiple() method, then passes control back to the previous form with a message saying how any occurrences were actually deleted. This type of function is usually used to delete occurrences from a LINK entity created by an ADD 3 form. This function is similar to DELETE 2 in that it has no screen dialog, but instead of receiving an array of primary keys it receives selection criteria which may identify any number of occurrences from the specified database table. These occurrences are then updated in a single operation (using the deleteSelection() method), usually by nullifying the column(s) that caused them to be selected in the first place. This is the reverse of a UPDATE 2 function. This is similar to a LIST 2, but will allow the current occurrence of the parent table, plus all related occurrences on the child table, to be deleted. Upon initial entry this function will retrieve the first of the selected occurrences from the ONE (parent) table, then retrieve associated rows from the MANY (child) table and display them starting at page 1. It will then use the $child_relations array in the parent database object to check if there are any other restraints which will prevent the deletion from continuing. If there are any such constraints then an error message will be generated. Parent Details Details of the parent entry which was selected in the previous function. All child entries are related to this parent. Parent Scrolling This will provide options to scroll forwards and backwards through the selected parent items. SEARCH - enter a new set of selection criteria before retrieving rows from the database. PREVIOUS SEARCH - use the previous selection criteria to retrieve rows from the database. NEW - allow a new occurrence of the current object to be added to the database. Column Headings These will be shown as hyperlinks so that the user can choose to have the data sorted by any column. Data Area As this area is for multiple occurrences the data will be shown horizontally, one occurrence per line. The select box on each line will be used to pass the primary key of that occurrence to the function associated with a button on the navigation bar. Pagination This area will allow the user to move forwards and backwards through the available 'pages' of data. This function is similar to DELETE 1, but instead of stopping if any occurrences on a child table are found for which the delete constraint is set to RESTRICTED it will instead act as if the constraint were set to CASCADE. This will cause ALL child occurrences, and the children of those children all the way down to the bottom of the relationship hierarchy, to be deleted from the database. Note: this will only erase data from tables which exist in databases which belong to the current subsystem. 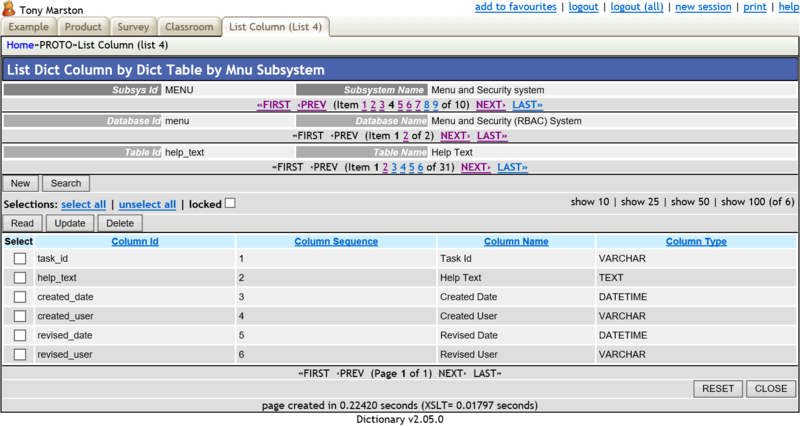 For example, when erasing a MNU_SUBSYSTEM entry from the MENU database it will not affect related tables in either the DICT database or the WORKFLOW database. The value of the audit logging flag $this->audit_logging in the initial table object will be passed down the hierarchy to each child object. If set to TRUE then all deleted records will appear in the audit log. If set to FALSE then no deleted records will appear in the audit log. Regardless of what value has been defined for this flag in normal operations an alternative value can be defined in the _cm_pre_eraseRecord() method which will take effect for the current operation only. Due to the large number of records that can be deleted with a function of this type it should only be created where absolutely necessary, and access permissions should only be granted to responsible personnel. It would also be a good idea to have some sort of export function so that the data can be reinstated if required. 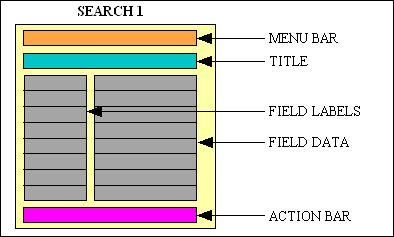 This type of function will allow the user to view details from the database. No type of update is allowed. Upon initial entry this function will retrieve a record from the database using the primary key(s) passed down by the previous form. Navigation Bar This is usually empty for this type of function, but may contain buttons which will allow the user to select other functions which show more details related to the current occurrence. This type of form is used to display multiple occurrences (rows) of a database table. It shows summary details only, one entry per line. It does not allow any updates, but a series of navigation buttons will provide access to other forms/functions/screens that should be able to add, update or delete occurrences of the table. In these forms the total number of rows may too large to display in a single page, therefore each page may be limited to a certain number of rows. In this case pagination options will be made available which will allow the user to select a particular page to display. Upon initial entry this function will display details starting at page 1. 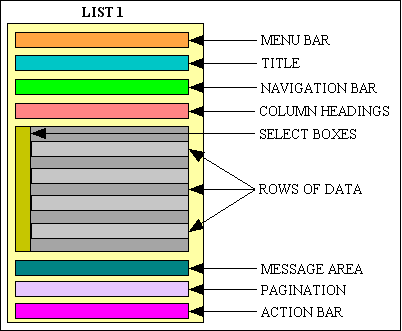 The number of rows in each page is held within each data object, but can be changed using options in the navigation bar. It is also possible for selection criteria to be passed down from the previous function, in which case this will be used when retrieving data from the database. RESET - reset any search, sort or page settings to their original values an re-retrieve the data as if the function were being started afresh. This function is used in a ONE-to-MANY relationship to display occurrences of MANY for a selected occurrence of ONE. Upon initial entry this function will retrieve the first of the selected occurrences from the ONE (parent) table, then retrieve associated rows from the MANY (child) table and display them starting at page 1. 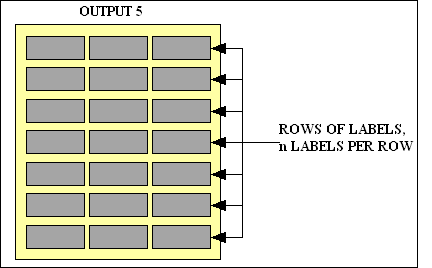 The number of rows in each page is held within each data object, as is any default sort criteria. This function is used in a PARENT-to-CHILD-to-GRANDCHILD (or OUTER-to-MIDDLE-to-INNER) relationship where both PARENT-to-CHILD and CHILD-to-GRANDCHILD are defined as ONE-to-MANY relationships. For each occurrence of PARENT it will show related occurrences from the CHILD, and for each occurrence of CHILD it will show related occurrences from the GRANDCHILD. 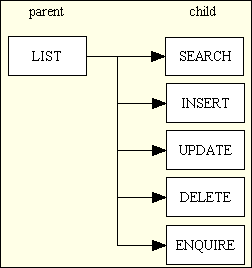 Upon initial entry this function will retrieve the first of the selected occurrences from the PARENT/OUTER table using the selection criteria passed down by the previous form, then for the current PARENT it will retrieve the first of the associated occurrences from the CHILD/MIDDLE table. It will then retrieve associated occurrences from the GRANDCHILD/INNER table and display them starting from page 1. Child Details This will show occurrences from the child table which are related to the current parent. All grandchild entries are related to this child. Child Scrolling This will provide options to scroll forwards and backwards through the child items which are related to the current parent. This function is used in an OUTER-to-MIDDLE1-to-MIDDLE2-to-INNER) relationship where both OUTER-to-MIDDLE1, MIDDLE1-to-MIDDLE2 and MIDDLE2-to-INNER are defined as ONE-to-MANY relationships. For each occurrence of OUTER it will show related occurrences from MIDDLE1, for each occurrence of MIDDLE1 it will show related occurrences from MIDDLE2, and for each occurrence of MIDDLE2 it will show related occurrences from INNER. Upon initial entry this function will retrieve the first of the selected occurrences from the OUTER table using the selection criteria passed down by the previous form, then for the current OUTER it will retrieve the first of the associated occurrences from the MIDDLE table, then it will then retrieve associated occurrences from the MIDDLE2 table. It will then retrieve associated occurrences from the INNER table and display them starting from page 1. Outer Details Details of the outer entry which was selected in the previous function. All middle1 entries are related to this outer. Outer Scrolling This will provide options to scroll forwards and backwards through the selected outer items. Middle1 Details This will show occurrences from the middle1 table which are related to the current outer. All middle2 entries are related to this middle1. Middle1 Scrolling This will provide options to scroll forwards and backwards through the middle1 items which are related to the current outer. Middle2 Details This will show occurrences from the middle2 table which are related to the current middle1. All inner entries are related to this middle2. Middle2 Scrolling This will provide options to scroll forwards and backwards through the middle2 items which are related to the current middle1. These are called multi-purpose because they may allow more than one function within a single component. This is used to maintain what is sometimes referred to as a MANY-to-MANY relationship but what is actually a ONE-to-MANY-to-ONE relationship, as described in How to handle a Many-to-Many relationship with PHP and MySQL. In this case the MANY table (also known as the INTERSECTION, XREF or LINK table) is used to indicate that a relationship exists between an occurrence of the first (outer) ONE table and an occurrence of the second (inner) ONE table. This is achieved by having the primary key of the MANY (LINK) table constructed by combining the primary keys of the other two (OUTER and INNER) tables - thus the existence or non-existence of a record on the MANY (LINK) table indicates the existence or non-existence of a link between the other (OUTER and INNER) tables. This function deals with two ONE-to-MANY relationships in the form of OUTER-to-LINK and INNER-to-LINK, which means that one of the ONE tables is designated as OUTER while the other is designated as INNER. It should not matter which is OUTER and which is INNER as they should be interchangeable. It should therefore be possible to create two versions of this transaction where each ONE table takes its turn at being OUTER as well as INNER. Upon initial entry this function will retrieve an occurrence of the OUTER table using selection criteria passed down from the previous screen. If the selection criteria results in multiple occurrences then scrolling options will be made available. 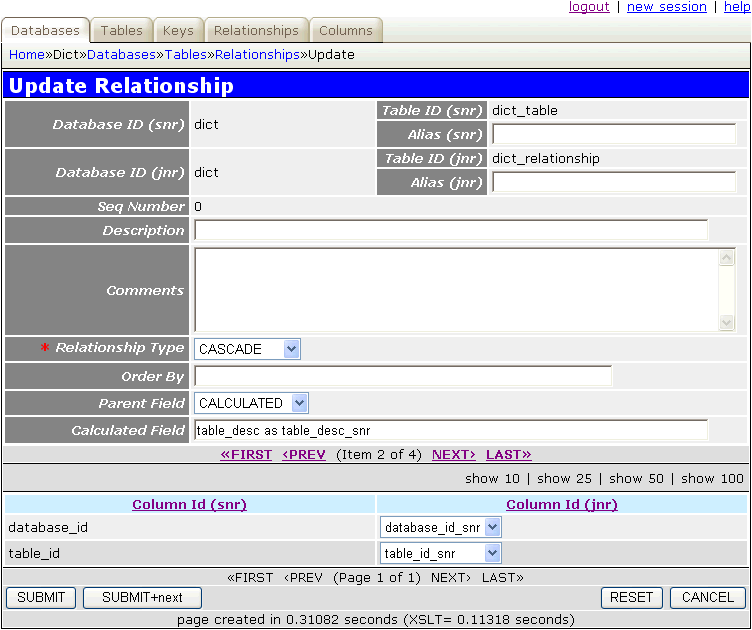 It will then fill the LINK area by retrieving occurrences from both the LINK and INNER tables by means of an sql JOIN. 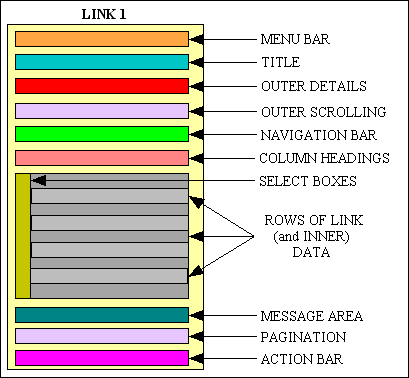 There may be more occurrences of LINK than can fit onto a single page, so pagination options may be made available. The INNER/LINK area will show all available occurrences from the INNER table, and if a corresponding entry exists on the LINK table then the SELECT box will be set to ON. If no corresponding entry exists on the LINK table then the SELECT box will be set to OFF. The user may toggle the value within any number of these SELECT boxes, then by pressing the SUBMIT button in the action bar the contents of the LINK table will be adjusted accordingly. The initial display will show all available occurrences of OUTER which may contain a mixture of selected and non-selected occurrences of INNER. The SEARCH button in the navigation bar may be used to alter the display to show only those occurrence of INNER which have been selected, or alternatively only those occurrences which have not been selected. Note that the navigation bar does not contain buttons for ADD or DELETE as records on the LINK table are added or deleted by toggling the SELECT box on each line. In a simple situation the LINK table contains only a primary key, but it is possible for it to contain a number of non-key fields which may have their values displayed in the screen so that the user may change them. Both situations can be catered for by specifying the relevant sql SELECT values in the component script. OUTER Details Details of the OUTER entry which was selected in the previous function. The select box on each line is used to indicate the existence of an occurrence of the LINK entity. By changing the setting for an occurrence and pressing the SUBMIT button on the action bar the associated occurrence of the LINK entity will be created or deleted as appropriate. SUBMIT - create or delete occurrences of the MANY entity as deemed necessary by any changes to the select box on each row of ONE(b) data. This has a screen similar to Update 1 but will allow one or more occurrences to be either inserted or updated depending on whether they currently exist or not. Due to the fact that rows may not currently exist the default scrolling mechanism cannot be used, therefore an array of occurrences has to be built using the setScrollArray() method which uses any selection criteria passed down to it by the parent screen. The getScrollItem() method is then used to navigate through this array. This allows custom code to be inserted such as the ability to jump over entries in the array depending on certain values being present. When the SUBMIT button is pressed on each screen either the insertRecord() or updateRecord() method will be called, as appropriate. RESET - abandon latest input and reset the screen to its prior contents. DELETE - will delete the current record. This will allow multiple MANY occurrences in a ONE-to-MANY (parent-child) relationship to be modified in a single operation. The identity of the ONE (parent) will be passed down from the previous screen. Occurrences of the MANY (child) will be retrieved and displayed starting at page 1. Standard pagination options will allow the user to step through all available pages. If more than one occurrence of the ONE table was selected then scrolling options will be made available. Values may be changed in any number of rows, then sent to the database by pressing the SUBMIT button in the action bar. By default the inner zone can only be used to modify existing rows, although navigation buttons can be used to run other tasks to add or remove rows one at a time. However, it is possible to use custom buttons to add or remove rows dynamically using the procedure documented in FAQ156. Note that these additions or deletions will not be actioned until a SUBMIT button is pressed. Note that the updateMultiple() method call also perform inserts and deletes as well as updates. NEW - allow new occurrence(s) of the child object to be added to the database. This must refer to a task of type ADD 3 in order to select the required entries, then add them to the database. DELETE - allow selected occurrence(s) of the child object to be deleted from the database. This must refer to a task of type DELETE 2 in order to delete the selected entries. This is similar to MULTI 2 but instead of a PARENT-CHILD relationship it displays a GRANDPARENT-PARENT-CHILD relationship. This is expressed as OUTER-to-MIDDLE-to-INNER. Occurrences of OUTER and MIDDLE will be shown one at a time and will be read-only. The multiple occurrences of INNER may be modified. The identity of OUTER will be passed down from the previous screen. The first available occurrence of MIDDLE will be automatically retrieved, as will associated occurrences of INNER starting at page 1. Standard pagination options will allow the user to step through occurrences of INNER, and while a separate scrolling area will allow the user to step through occurrences of OUTER and MIDDLE. MIDDLE Details Details of the MIDDLE entry which is available for this combination of OUTER and INNER. MIDDLE Scrolling This will provide options to scroll forwards and backwards through the available MIDDLE items. Navigation Bar This is not usually available for this type of function. Data Area As this area is for multiple occurrences the INNER data will be shown horizontally, one occurrence per line. This is the same as MULTI 2, but will allow updates to both the parent and child tables. If a field which is editable in the parent area also exists in the $fieldspec array of the child object, then that field will be included in the data which is sent to the child object. This is similar MULTI 2, but the outer/top/parent entity is used only to enter selection criteria while the inner/bottom/child entity is used to display and possibly amend those occurrences which satisfy that criteria. The bottom zone can be made non-amendable (read-only) as shown in FAQ110. The OUTER entity may be programmed to load initial selection criteria which are passed to the INNER entity for automatic retrieval, after which the criteria can be changed and sent to the INNER entity by pressing the RETRIEVE button. Alternatively data for the INNER entity may not be retrieved until after the RETRIEVE button is pressed. RETRIEVE - will cause the inner/bottom entity to be refreshed using the latest selection criteria from this outer/top zone. Other buttons may be added by following the instructions in FAQ 137. NEW - allow new occurrence(s) to be added to the database. DELETE - allow selected occurrence(s) to be deleted from the database. Note that these buttons will only perform operations on the inner/bottom/child entity. SUBMIT buttons will only be available if the lower area is amendable. This is similar MULTI 5, but instead of having just two zones it has three in a parent/outer, middle/child and inner/grandchild relationship. The OUTER entity may be programmed to load initial selection criteria which are passed to the MIDDLE entity for automatic retrieval, then the primary key of the current MIDDLE entity is passed to the INNER entity. After this the criteria can be changed and sent to the MIDDLE and INNER entities by pressing the RETRIEVE button. Alternatively data for the MIDDLE and INNER entities may not be retrieved until after the RETRIEVE button is pressed. RETRIEVE - will cause the child/grandchild entities to be refreshed using the latest selection criteria from this outer/top/parent zone. Child Details This will show occurrences from the child table which meet the selection criteria provided in the parent entity. All grandchild entries are related to this child. Child Scrolling This will provide options to scroll forwards and backwards through the child rows one at a time when there is more than one. See below for the option to display more than one row. Note that these buttons will only perform operations on the grandchild entity. Grandchild Area As this area is for multiple occurrences the data will be shown horizontally, one occurrence per line. // perform any initialisation for the current task. // NOTE: $selection is passed by reference as it may be amended. // NOTE: $search    is only available for OUTPUT tasks. Note that with this option you will have to manage the selection criteria for the middle/child and lower/grandchild entities with care. These functions will allow data to be output in formats other than HTML, such as CSV or PDF. This function does not have any visible screen. It will extract data using the selection and sort criteria passed down from the previous screen, convert that data to CSV format (Comma Separated Values) and send it to the client browser where it can either be viewed immediately (usually in a spreadsheet program) or saved to disk. 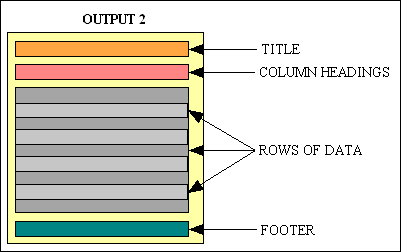 The first row of the output file will contain the column labels, while all subsequent rows will contain data, one line per record. This function will produce a PDF document which is suitable for printing. The completed PDF document can either be sent to the client or stored on the server. List View will output the data one record per line according to the specifications in the report structure file. More details on how this pattern can be used to produce customised reports may be found in RADICORE for PHP - creating PDF output. This function is designed to be processed from a navigation button in a parent form. Whatever selection and sort criteria which is currently being used in the parent form will be passed down to this task so that whatever is being shown on the screen will appear in the report, but without the pagination option which restricts the output to a limited number of records. This selection and sort criteria may be overridden within the task, if desired. title (optional) This is an optional title which will appear at the top of each page above the column headings, and may be spread over 1 or more lines. The contents of the title area are specified in the report structure file. column headings This will contain a heading above each column of data, as specified in the report structure file. data This will have one line of data for each record retrieved from the database. 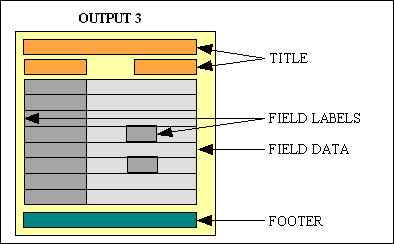 The identities of the fields to be displayed, and their sequence, is specified in the report structure file. There is also the option to append a line of accumulated totals at the end of the output. footer (optional) This will appear at the bottom of each page and will contain those elements which were specified in the report structure file. This function will produce a PDF document which is suitable for printing. The completed PDF document can either be sent to the client or stored on the server. List View will output the data one record per page according to the specifications in the report structure file. More details on how this pattern can be used to produce customised reports may be found in RADICORE for PHP - creating PDF output. data This will contain a combination of field labels and field data. Each line may contain either a single piece of data or multiple pieces of data. 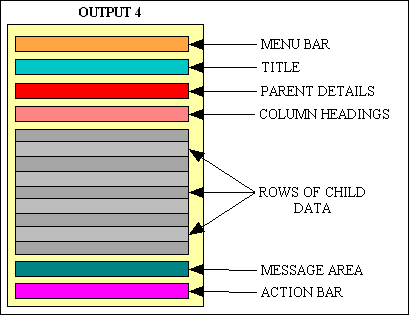 This function is similar to Output 1 but has a screen which allows the user to select which columns will be written to the output file. It will identify the columns which are available by selecting the first record and examining the result. Restore Selection - a dropdown list showing any existing selections that the current user has saved for this task. If there are no existing selections then this control will be hidden. If an entry is selected then that entry will be read from the database and loaded into the screen. If the details are changed they may either be updated or saved as a new selection. Description - a text box into which the user inserts a description or the current selection before pressing the "Save Selection" button. Save Selection - a button which will save the current selection with a new identity. Update selection - a button which will update the current selection with its existing identity. View selections - a button which will jump to a different screen which will show the user all his/her selections for the current task and all the descriptions to be updated, or for selections to be deleted. Limit - the maximum number of rows (records) to be extracted (default is 1000). See Note #1 below. Offset - the row number from which the extract will start (default is 0). See Note #1 below. Field Name - non-editable. Identifies the column which was read from the database. Selected - required. Set to 'Selected' to include this column in the output file, or 'No' to exclude it. Sort Seq - required. Identifies the order in which the columns will appear in each row of the output file. Label - required. Identifies the label which will be used for this column in the output file. SUBMIT - submit all data to the database, then return to the previous function. NOTE #2: By default the initial value of sort_seq will be the order in which the fields were defined in the SELECT part of the SQL query. These defaults can be altered by inserting the relevant code into the _cm_getColumnNames() method. These values can also be altered before pressing the SUBMIT button to produce the output file. This function will produce a PDF document which is suitable for printing. The completed PDF document can either be sent to the client or stored on the server. Each page of the document will contain nothing but lines of address labels, so there will be no heading and no footer. More details on how this pattern can be used to produce customised reports may be found in RADICORE for PHP - creating PDF output. This function is designed to be processed from a navigation button in a parent form. Whatever selection and sort criteria which is currently being used in the parent form will be passed down to this task so that whatever is being shown on the screen will appear in the report. This selection and sort criteria may be overridden within the task, if desired. The number of labels per row. The dimensions of each label. The font to be used for each label. Whether or not each label will have a printed border. The margin, if any, between the labels on each row. The margin, if any, between the rows. This will allow you to use any sort of commercial label stationery. This function does not have any visible screen. It will extract data for the top nodes in a hierarchy using the selection passed down from the previous screen, extract any child nodes down to any level, convert that data to CSV format (Comma Separated Values) and send it to the client browser where it can either be viewed immediately (usually in a spreadsheet program) or saved to disk. These screens are an alternative to dropdown lists and radio groups. This type of function is normally invoked from a parent function which has a popup button next to (or instead of) the data entry field. When this button is pressed it will activate the popupCall() method before calling the nominated task. After the popup form has been processed the original task will be reactivated, and the popupReturn() method will be used to deal with whatever has been selected. It is used to display the files that exist in a pre-selected directory in a multi-column layout. Each filename will be shown as a hyperlink, so all the user has to do to make a selection is to click on a filename. In cases where the files to be selected are images it may be possible to include a thumbnail image in the display. // perform any initialisation before displaying the File Picker screen. video An image of the file using the specified width and height, not the file's natural dimensions. The word 'image' is used for still images while 'video' is used for moving images. size The size of the file, in bytes. date The date on which the file was last modified. Please note that although the screen structure file contains the dimensions for the displayed images, it is also possible for these dimensions to be overridden by values specified in the _cm_initialiseFilePicker() method. The file names will be displayed without any directory names. The files will be displayed in pages of 100, in 2 columns. Pagination options will allow the user to select different pages. It is possible to have a SEARCH option on the navigation bar which returns selection criteria for a field called filename. This will be used to filter the file names before they are displayed. It is possible to have the FileUpload option in the navigation bar which will upload a new file. If this option is used the newly uploaded file will automatically be taken as the selected file and returned to the calling program unless the return_uploaded_file option is set to FALSE. If the hyperlink_direct option is set the hyperlinks for each file will go direct to the browser instead of being passed back to the task for processing via the _cm_filePickerSelect() method. If the source directory contains more than 2,000 files the directory listing will be stored in a cache file in order to speed up all subsequent page displays. If you do not supply a directory name in $this->cache_dir then the value from ini_get('session.save_path') will be used instead. This cache is 'per session', so a new file will be created for each session. You can manually rebuild the current cache by pressing the RESET button. This type of function can either be invoked from a menu or navigation button, but can also be invoked from a parent function which has a popup button next to (or instead of) the data entry field. When this button is pressed it will activate the popupCall() method before calling the nominated task. After the popup form has been processed the original task will be reactivated, and the popupReturn() method will be used to deal with whatever has been selected. This will allow the user to upload a file from his device to the server. Note that a file can be rejected if it is the wrong type or above a maximum size. The name of the directory into which the file will be uploaded. A list of valid MIME Media Types (or a single type of 'image' to cover all possible image types, or '*' for any file type). The maximum file size, in bytes. Any file larger than this will be rejected. // perform any initialisation before displaying the File Upload screen. If $this->allow_multiple is set to TRUE then this will enable the 'SUBMIT+stay' button so that after a file has been uploaded it will stay in the screen so that another file can be uploaded. This indexed array can contain any number of entries. The name of the uploaded file can be changed by code in the _cm_fileUpload() method. After the file has been uploaded it can be processed by code in the _cm_post_fileUpload() method. 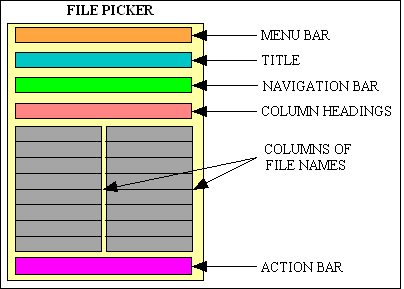 This function may be called in place of a filepicker, or from the navigation bar of a filepicker, or from a popup button. This function does not have any visible screen. This will allow the user to download a file from the web server to his client device. The user selects an entity which contains the name of the file to be downloaded, then activates this transaction by pressing a button on the navigation bar. Alternatively this can be used to process files which are selected in a filepicker screen. // perform any initialisation for the file download operation. If you place the value 'inline' into $this->download_mode it will display the file in the browser without providing the option to save it to disk. // errors are added to $this->errors. NOTE: this pattern uses the mime_content_type function which requires the mime_magic.magicfile = "/path/to/magic.mime" directive in your php.ini file. CHOOSE - after selecting at least one row from the current display by checking the associated box in the SELECT column this button will cause the selected rows(s) to be passed back to the previous function for processing. If the SELECT column contains checkboxes then multiple selections can be made, but if it contains radio buttons then only a single selection can be made. CHOOSE NULL - This will cause the current selection in the parent screen to be nullified or cleared. This is different from the 'Cancel' button which will terminate the popup process without making a selection, thus leaving any current selection unchanged. This option is not available in popups which allow multiple selections. Note that when the CHOOSE button is pressed in a POPUP screen it will cause the chooseButton() function to be called. If the SELECT column contains checkboxes then it is possible to select more than one occurrence from the current screen. If only a single selection is possible then these checkboxes should be changed to radio buttons. This can be achieved by putting the string select_one=TRUE into the SETTINGS field for the popup task. If the identity is known BEFORE the popup is activated then it should be supplied in the _cm_popupCall() method. If a value for the parent/outer entity is not supplied when the popup is activated it will by default immediately return with the message "Nothing selected from popup screen". This situation can be trapped in the _cm_initialise() method in order to suspend the current popup while a second popup is activated to provide a value. These procedures are discussed in the FAQ. Note that this situation also exists with POPUP 4 as it also deals with two entities. This type of function is used to enter selection criteria before retrieving data from the database. It is usually called from a LIST function via a button on the navigation bar and will cause that function to perform a new retrieve using the modified selection criteria which is passed back to it. It is possible to force the LIST function to automatically jump to the search screen by using the initial_passthru option in the Update Task screen. Note that if the LIST function was activated with initial selection criteria passed down as context from the previous screen then the search screen can only add to this criteria. It cannot modify or remove the initial selection criteria which will be shown as non-editable text. 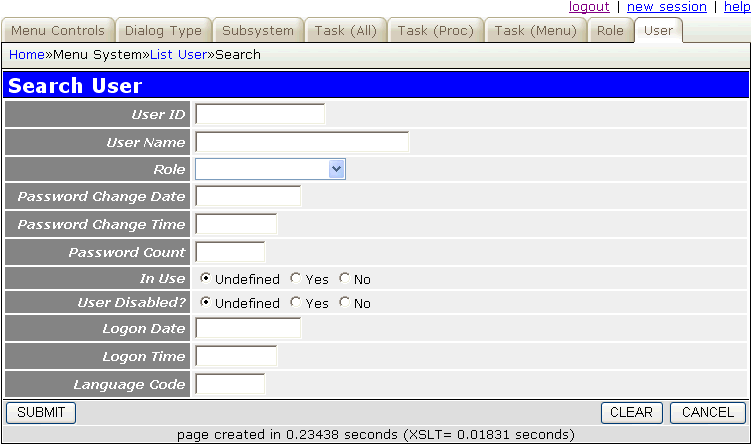 Some tasks may use the QuickSearch Bar to provide a faster method of performing searches. This function may also be used to enter selection criteria for a BATCH or OUTPUT task, in which case the _cm_post_search() method must be used to identify the new task so that it can be activated. It is not possible to pass the selection criteria back to the previous task if that task is of type BATCH or OUTPUT as this type of task cannot be suspended. Upon initial entry this screen will usually be blank, but it may contain some values which were set in the parent form and which cannot be changed. If any previous values have been set using this screen then they will be shown as well (this will also cause the parent screen to have a PREVIOUS SEARCH button in the navigation bar). The user may enter whatever selection criteria is desired, then press the SUBMIT button to have it passed back to the calling transaction for processing. By default the 'required' setting for each field will be turned off before the screen is displayed so that all fields are optional, but this can be re-instated in the _cm_changeConfig() method if necessary. % (percent) To represent zero or more characters. _ (underscore) To represent any single character. You may also use the terms 'is null' and 'is not null' in any field. Boolean fields which are normally restricted to YES/NO or TRUE/FALSE will include a third option of UNDEFINED. SUBMIT - return to the previous function with the current screen contents as selection criteria. This will cause the contents of that screen to be rebuilt using this criteria. CANCEL - return to the previous function without passing any selection criteria. CLEAR - clear all data from the current screen. 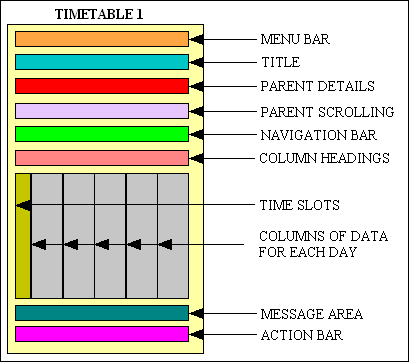 This type of function is used for timetables or schedules. 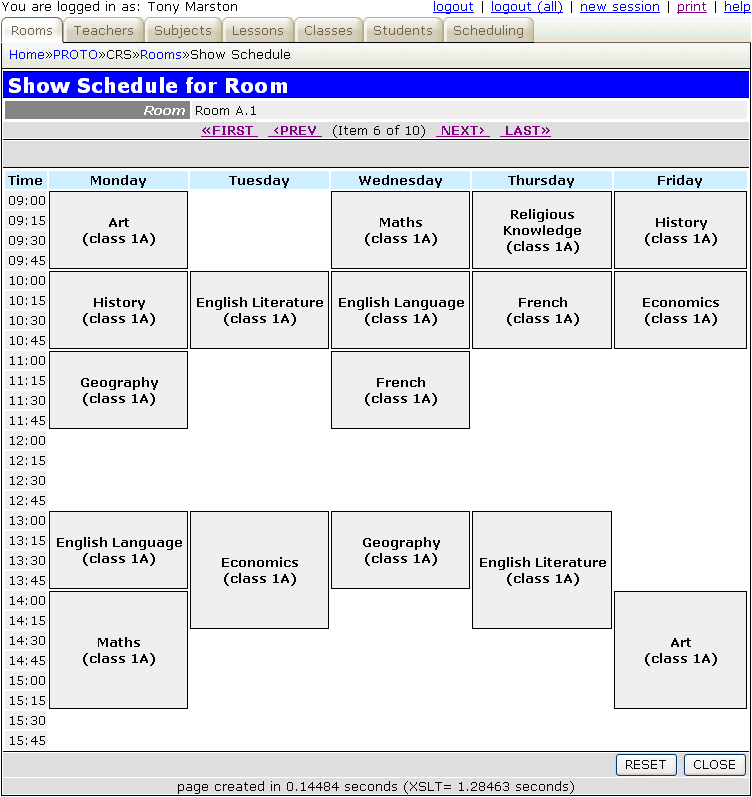 This function is used to display all the schedule/timetable (child) entries for a selected parent. Upon initial entry this function will retrieve the first of the selected occurrences from the ONE (parent) table, then retrieve all the associated rows from the schedule/timetable (child) table and display them on a single page with a separate column for each day. Each scheduled event will appear as a separate box in the relevant column for that day, with the top of the box aligned with the start time (as shown in the column on the far left) and the bottom of the box aligned with the end time. Navigation Bar This may contain any buttons which are deemed appropriate for this function. Column Headings These will not be shown as hyperlinks as the column sorting option is turned off. Each scheduled event will be represented as a box containing a description. The top of the box will be aligned with the top of an entry in the Time Slot column to indicate the start time of the event. The bottom of the box will be aligned with the bottom of an entry in the Time Slot column to indicate the end time of the event. 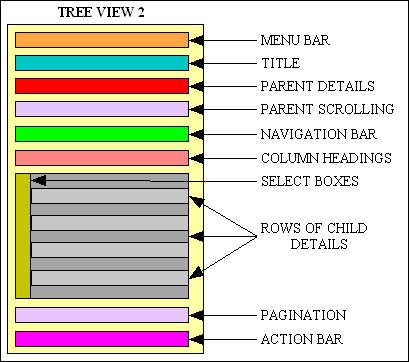 These types of screens are used to display the nodes in a tree structure where one node can be the parent of other nodes. This is a hierarchical structure which can support any number of levels. 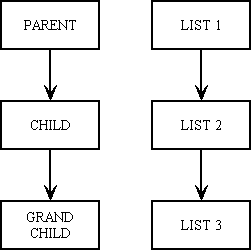 This screen accesses a simple hierarchical structure where a node can have zero or one parent but any number of children. A node without a parent is known as a root node, and upon initial entry to this screen only root nodes will be displayed. If a node has children then a button will be made available to either show or hide those children. Column Headings This is a label above each column of data. These will not be presented as hyperlinks as no sorting of the screen contents is allowed. 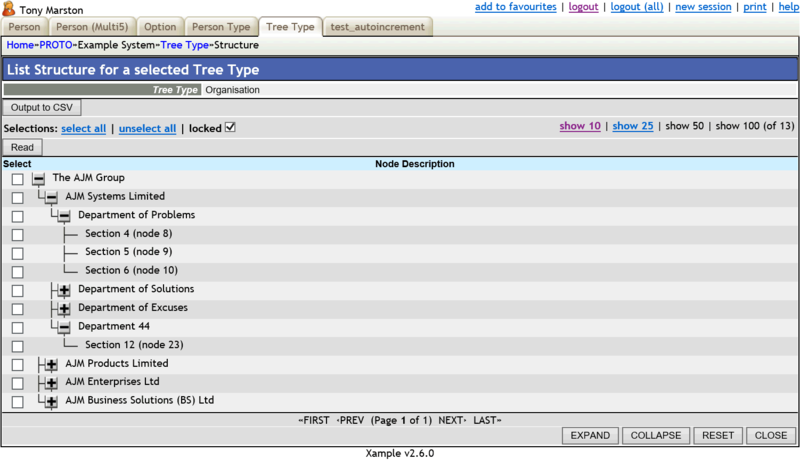 - EXPAND the current node to show its children in the tree structure. All child nodes will be indented one button width to indicate that they exist at a lower level. - COLLAPSE the current node to hide its children. These buttons will toggle from one to the other each time they are pressed. Pagination This will only function on the first set of entries, not those which can be added by pressing the EXPAND button. EXPAND - expand all nodes for the entire tree structure. COLLAPSE - collapse all nodes in the entire tree structure leaving nothing but the original root nodes. Note that it is possible to add extra columns to the screen following the node description, as shown in the following example. Details can be found in the screen structure file. This is similar to TREE 1 but has an outer and an inner entity. The identity of the top/outer/parent entity will be passed down from the previous screen, and the bottom/inner/child entity will show that hierarchy of details, starting with all root nodes, which belong to the top/outer/parent entity. It shares the same screen areas as the Tree View 1 screen. This is similar to a TREE 2, but the outer/top/parent entity is used only to enter selection criteria while the inner/bottom/child entity is used to display those occurrences which satisfy that criteria. This type of function is used to update existing occurrences on the database. Upon initial entry this function will retrieve one or more records from the database using the primary key(s) passed down by the previous form. It will display the current values for one record at a time and allow the user to change them. SUBMIT+next - submit all data to the database, then skip to the next item (if available). If it is necessary to prevent everyone except the record's creator from amending the record this can be achieved by putting the string created_user=$logon_user_id into the SETTINGS field for the task. This function does not have any visible screen. It passes control to a POPUP screen where the user can select one or more occurrences, then uses the _cm_updateSelection() method to perform some sort of update. This may typically be to update each of the selected entries with the identity of the parent record. This is the reverse of a DELETE 3 function. This function has a screen similar to Update 1 but instead of having each field coming from the same database row, each field is actually from a different row in the same table. This is a design I have used successfully for many years to deal with what is sometimes referred to as 'control' data. Instead of having a single row with many values I have many rows each containing a single value. This allows me to add or delete values from the 'control' data without having to make any changes to the database structure. For more details please refer to A flexible method of storing control data. The class for my 'control' table then defines which values are to be retrieved from the database and how they are to be displayed on the screen. When the SUBMIT button is pressed these are updated using the _cm_updateSelection() method. Note that this method has been modified so that it will handle inserts as well as updates. This function does not have any visible screen. It will allow one or more database rows to be updated without being displayed. Any selection criteria is passed down from the previous screen. Rows are then retrieved from the database using the getData() method, modified by code within the table class, then written to the database using the updateMultiple() method. Alternatively the application code may decide not to update the database (by not putting anything in the output array) but to write results out to a non-database file, as in mnu_subsystem(upd4)export. Note that the updateMultiple() method can also perform inserts and deletes as well as updates. This function does not have any visible screen. It will allow one or more database rows to be inserted or updated without any dialog with the user. These rows must be constructed within the initialise() method so that they can be processed using the insertOrUpdate() method. This will examine each record in turn, and call either insertRecord() or updateRecord() depending on whether the primary key currently exists in the database or not. Although there are advantages from being able to pick from a large variety of templates, the biggest problem is deciding which template, or combination of templates, to use in a particular set of circumstances. Just because a template is designed around a particular database structure does not mean that wherever you see that database structure you must use that template. There may be more than one option, so you have to be aware of the different options before you make a decision. List 1, List 2 or List 3? Although this combination would work, it may not be the best solution. A LIST 2 function cannot be accessed from an option in the menu bar as it requires some sort of context to be passed down from the previous screen. It can only be accessed from an option in the navigation bar, and is then constructed by whatever context is passed down to it. This means that it would not be possible to view the contents of the 'person' table without first selecting a value for 'person_type'. It would not be possible to exclude 'person_type' from the search criteria, so each screen would only show entries of the same type. A SEARCH screen can only be used to supply additional selection criteria and cannot modify any initial criteria passed down as context by the previous screen. This arrangement implies that once you have created a 'person' entry that you cannot change its value of 'person_type'. A LIST 1 function can be accessed from an option on the menu bar as it does not require any sort of context to be passed down to it. If it is accessed from an option on the navigation bar then it will be restricted by any context which is passed down to it. 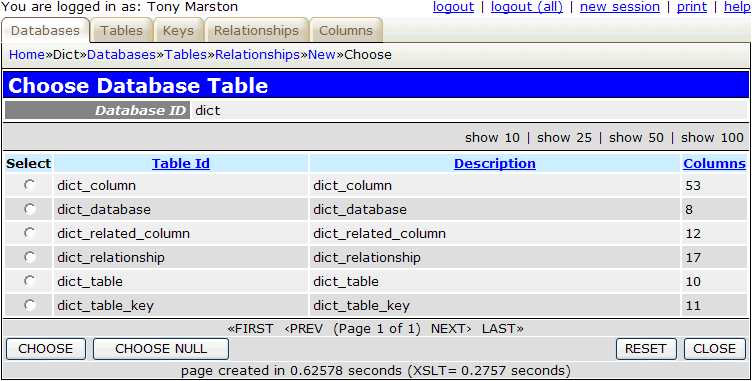 This means that it is possible to access the 'person' table without first selecting a value for 'person_type'. Once inside the LIST 1 screen it is possible to change the selection criteria to include or exclude a value for 'person_type' by activating the SEARCH 1 screen. When creating a 'person' record the choice of 'person_type' is made from a picklist after entering the 'person' screen, not before. When amending a 'person' this method implies that it is possible to change the value for 'person_type' from the picklist. This is made possible by the fact that 'person_type' is not part of the primary key. Having said that a LIST 1 screen should be the primary method of accessing the 'person' table, there is no reason why you cannot have a LIST 2 screen as an option the navigation bar of the 'person_type' screen as a secondary method of access. A 'person_address' always belongs to a particular 'person', so it is perfectly valid to select a 'person' before being able to access any address records for that person. When creating a new address it is not logical to activate the 'add address' screen and then choose the person. As you already know the person to whom the address belongs it is perfectly logical to start from a person screen and then say "add a new address to this person". Once an address has been created for a person it is not possible to switch that address to another person. This is enforced by the fact that 'address_no' is part of the primary key. 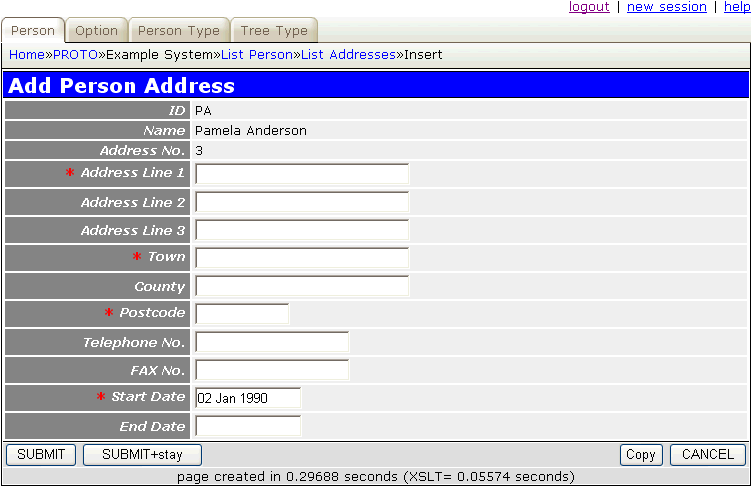 The use of a LIST 3 screen to access the 'person_address' table is not justified as it would mean starting with the LIST 1 screen in order to choose a 'person_type' before being able to navigate down to the LIST 2 screen to choose a 'person'. This extra step would insist that you know the value of 'person_type' before being able to view 'person', and as this restriction does not exist in real life it should not be enforced by the software. Having said that a LIST 2 screen should be the primary method of accessing the 'person_address' table, there is no reason why you cannot have a LIST 1 screen as an option on a menu bar as a secondary method of access so that you can perform searches and inquiries without being restricted to a particular person. Add 1, Add 2, Add 3 or Add 4? All of these will add records to the database, but with subtle variations. ADD 1 is typically called from a navigation button in a LIST 1 screen to add a single record to the database. This does not require any context passed down to it before it can function as all data is input through its screen. Links to foreign tables can be made using picklists (dropdowns or popups). The same picklists are also available in the UPDATE 1 screen, so this implies that whatever values are chosen in the ADD screen can be changed in the UPDATE screen. 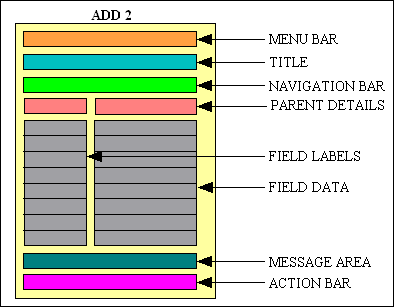 ADD 2 is typically called from a navigation button in a LIST 2 screen to add a single record to the database. It cannot function without context being passed down to it (the primary key of a parent table). Although it would be possible to choose the parent identity from a picklist (after all, it is just another foreign key) as in an ADD 1 screen, this implies that the same picklist would be available in the UPDATE 1 screen making the identity of the parent table an updatable field. Where this value cannot be changed, for example because it is part of the primary key, then an ADD 2 should be used in preference to an ADD 1. 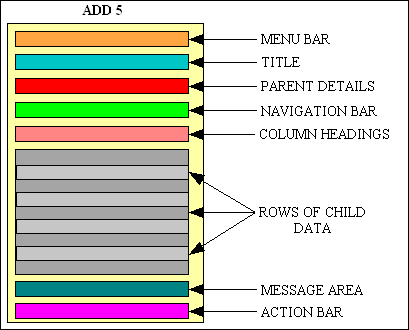 ADD 3 is typically called from a navigation button in a MULTI 2 screen to add one or more records to the MANY table of a ONE-to-MANY-to-ONE relationship (i.e. where the MANY table has two parents). This function does not have a visible screen. 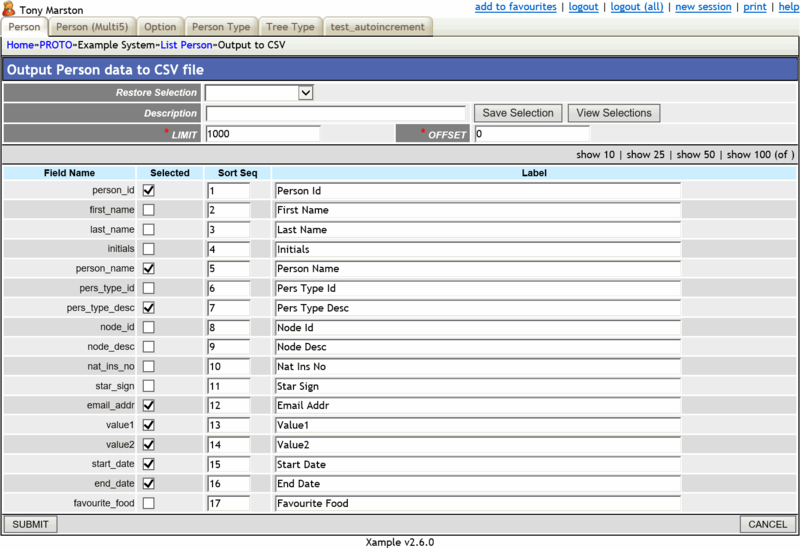 All it does is call a POPUP screen which will allow the user to select one or more occurrences from the second MANY table, then combine this selection with the primary key of the first MANY table to add new occurrences to the link/intersection table (using multiple calls to the insertRecord method). ADD 4 is typically called from a navigation button in any type of screen. It has no visible screen of its own as all it does is use whatever context is passed down to it to construct an array of one or more entries which are then added to the database. Update 1, Update 2, Update 3 or Update 4? All of these will update records in the database, but with subtle variations. UPDATE 1 is typically called from a LIST 1 or LIST 2 screen in order to update one or more selected records. The current details of each selected record are shown one at a time, and the user may make any changes and commit them to the database by pressing the SUBMIT button, cancel all further changes by pressing the CANCEL button, or move on to another selected record by using the scrolling area. UPDATE 2 does not have a visible screen of its own. Instead it passes control to a POPUP screen so that the user can select one or more records. It then passes the selection plus the identity of the parent record to the _cm_updateSelection method which will perform the update. This will typically be to update each selected record with the identity of the parent. This is the reverse of a DELETE 3 function. UPDATE 3 is used to update values on a control table which, instead of being implemented as a single record with a large numbers of fields, actually exists as a collection of records which hold one value each. 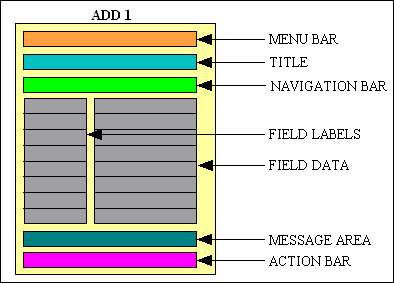 This design means that fields can be added or deleted from the control table without amending the structure of the database. UPDATE 4 does not have a visible screen of its own. It uses whatever context is passed down from the calling screen to construct an array of one or more database records to be updated, which are then processed by the updateMultiple method. Alternatively the application code may decide to leave the array empty (thus not updating the database) and instead write results out to a non-database file, as in mnu_subsystem(upd4)export. Delete 1, Delete 2, Delete 3 or Erase 1? All of these will remove records from the database, but with subtle variations. DELETE 1 is typically called from a LIST 1 or LIST 2 screen in order to delete one or more records from the database. The current details of each selected record are shown one at a time, and the user may confirm the deletion by pressing the SUBMIT button, reject the deletion by pressing the CANCEL button, or move on to another selected record by using the scrolling area. If there are any entries on related tables for the current record which are marked as RESTRICTED then the record cannot be deleted. If there are any entries on related tables for the current record which are marked as CASCADE then these will be deleted when the current record is deleted. 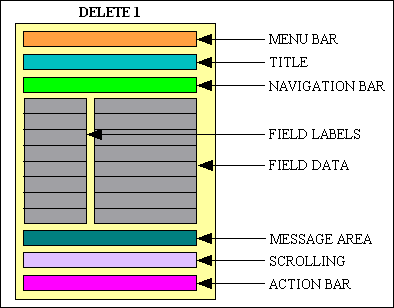 DELETE 2 is typically called from a MULTI 2 screen in order to delete one or more records from the database. Note that this function does not have any user dialog. It simply deletes each selected record and returns control back to the calling screen. DELETE 3 is similar to DELETE 2 in that it can deal with multiple records without any user dialog, but the difference is that instead of receiving an array of primary keys it receives selection criteria which may include any number of records on a particular database table. The actual action performed on these records is not hard-coded, it is specified in the _cm_deleteSelection() method. It may actually delete the selected records, or it may update them by nullifying a foreign key. ERASE 1 should only be used in special circumstances as it ignores any RESTRICTED constraints on child relationships and removes an entire hierarchy of records from the database. This type of function would normally be accompanied by some sort of 'export' function which would provide a backup of that hierarchy of records so that it can be reinstated if necessary. Link 1, List 2 or Multi 2? For the maintenance screens it is necessary to start with one of the parents and list its children, and perhaps showing some data retrieved from the other parent table. In this situation there are various combinations of templates which are available, and, depending on the particular circumstances, one may be more beneficial than the others. There is no ADD/INSERT/NEW option as new records will be created by setting a checkbox ON. There is no DELETE option as existing records will be deleted by setting a checkbox OFF. There is no ENQUIRE option as there is no other data to view. The SEARCH option may be used to restrict the display to only those occurrences where the checkbox is ON, where the checkbox is OFF, or any other selection criteria. In this situation the LIST 2 screen would cover the ORDER and ORDER_ITEM tables, while the PRODUCT table would be the subject of a POPUP from within the ORDER_ITEM(add) and ORDER_ITEM(update) screens. If it were ever needed to access the ORDER_ITEM table via a PRODUCT, then this combination would be the subject of a separate LIST 2 screen. Additions are handled via an ADD 3 screen which does not have a visible screen of its own. 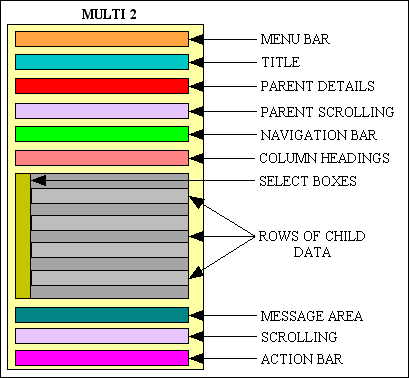 Its purpose is to pass control to a POPUP screen which allows the user to choose one or more entries from the 2nd parent table, and once these entries have been chosen to insert the relevant entries into the child table, then return control to the MULTI 2 where the newly-inserted records will be made available for modification. Deletions are handled via an DELETE 2 screen which again does no have a visible screen of its own. It will simply take the list of primary keys passed down to it and delete those records from the database without requiring any further confirmation. The maintenance of the ROLE-TASK table is handled with a pair of LINK 1 screens, one which will link a Role to a selected Task, and another which will link a Task to a selected Role. The maintenance of the NAVIGATION_BUTTON table is best handled by a MULTI 2 screen, but a LINK 1 screen and a LIST 2 screen are also provided so that you can see the difference. Multi 1, Multi 3 or Multi 4? These will allow several database records to be updated at a time, but with minor variations. MULTI 1 is similar to UPDATE 1 in that it shows one record at a time, but it may also allow new database records to be created. The collection of records to be shown is constructed via the setScrollArray() method, and as the SUBMIT button is pressed each record will be processed by the insertRecord() or updateRecord() method as appropriate. MULTI 3 is similar to a LIST 3 but will allow the most junior database entries to be modified. MULTI 4 is similar to a MULTI 2 but will allow both the parent and child entities to be updated. 02 Feb 2019 Updated the TREE 1 and TREE 2 patterns to include the ability to add extra columns to the screen. Added the TREE 3, ADD 6, ADD 7 and LIST 4 patterns. 01 Aug 2018 Updated OUTPUT 4 pattern to change the selected control from a dropdown list to a checkbox. Updated TREE 1 and TREE 2 patterns to include call to getExtraData() and getCollapsed() methods. Updated ADD 1 and ADD 2 patterns to include call to changeActionButtons() method. Updated UPDATE 1 pattern to include call to quitButton() method. Updated SEARCH 1 pattern to include call to clearEditableData() method. 03 Aug 2017 Updated OUTPUT 4 pattern to include columns for sort_seq and label. 01 Feb 2017 Updated ADD 4 . ADD 5 patterns to show that they can perform updates and deletes as well as inserts. Updated UPDATE 4, MULTI 2, MULTI 3, MULTI 4, MULTI 5 and MULTI 6 patterns to show that they can perform inserts and deletes as well as updates. 01 Aug 2016 Amended the ADD1, ADD2 and ADD5 patterns to include a call to the quitButton() method. Amended FILEPICKER so that it can show video files. 01 Apr 2016 Amended the File Upload pattern to include a call to the getExtraData() method. 12 Dec 2015 Amended the OUTPUT 4 pattern to include the ability to save the current selection so that it can be restored on a subsequent visit to the same task. 01 May 2015 Amended the LIST 3 pattern to allow the $allow_zero_rows property for the middle entity, which will allow the inner entity to be processed even if the middle entity does not return any database rows. 01 Mar 2015 Amended the File Upload pattern to allow the 'SUBMIT+stay' button, and to return an array of details for each uploaded file. 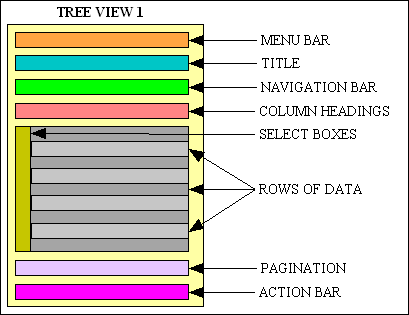 01 Jul 2014 Amended the Tree View 1 and Tree View 2 patterns to allow pagination. Added the Output 6 pattern. 01 Jun 2014 Amended the Filepicker pattern to use a cache for the directory contents when it contains more than 2000 files. 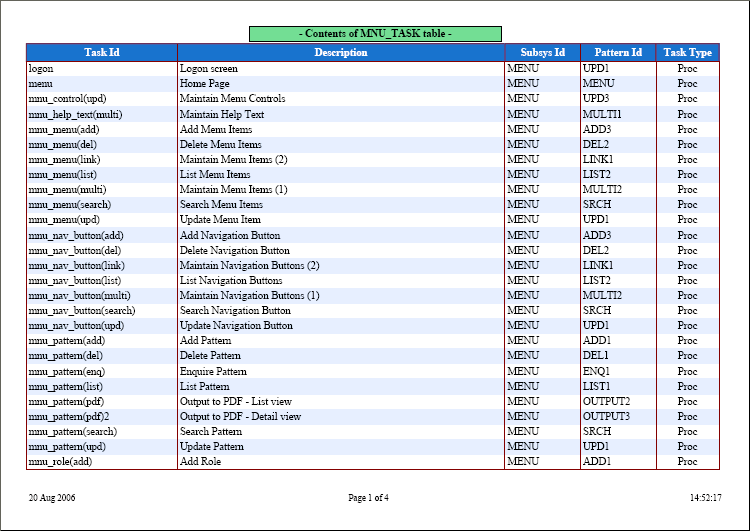 01 Dec 2013 Amended the Add 5 and Multi 6 patterns to include a reference to FAQ156. 01 Dec 2013 Added the Multi 6 pattern. 22 Jun 2013 Added the Multi 5 pattern. 25 Aug 2011 Added the Output 5 pattern. 01 Jun 2011 Added Title & QuickSearch Bar. 01 Jan 2011 Updated the add to favourites option in the Menu Bar so that it will also save the current menu bar values so that when the task is selected from the list of favourites the menu bar can be reconstituted. 01 Aug 2010 Updated Menu Bar to include the add to favourites option. 08 Jul 2009 Updated Search 1 to include a call to the post_search() method. 01 Jun 2009 Updated Navigation bar to include the row count. 01 May 2009 Updated File Upload to include a call to the post_fileUpload() method. Updated Navigation Bar to include the ability to lock the current selection. 01 Jan 2009 Added Associated/Related Rows. 01 Dec 2008 Amended the Filepicker pattern to allow the file's size and modification date to be included in the display. 01 Nov 2008 Amended the Pagination and Scrolling areas to make the displays configurable. 01 Oct 2008 Amended the FilePicker pattern to automatically select any file which is inserted using the FileUpload pattern. 01 Jul 2008 Added the Output 4 pattern to allow columns to be selected before being output to a CSV file. 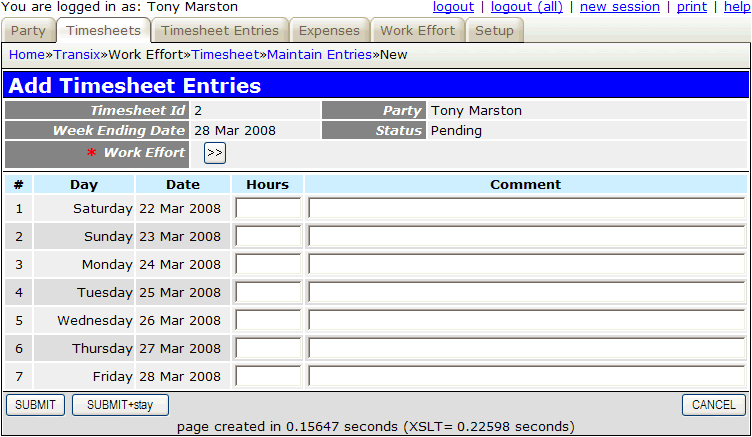 01 May 2008 Added the Add 5 pattern to allow multiple entries to be input on a single screen. 01 Feb 2008 Amended the Update 1 and Delete 1 patterns to include the ability to restrict processing to the record's creator by using the settings field. Pagination options for large file sets. The ability to include a 'search' option on the navigation bar. A 'reset' button on the action bar to remove any search criteria. 01 Nov 2007 Amended the File Upload pattern so that it will call the resizeImage() function if required. 25 Jul 2007 Amended the Multi4 pattern so that a field which is updated in the parent object can also be passed down to the child object. 01 May 2007 Added Update5 pattern. Amended Search1 pattern by adding a call to the _cm_validateSearch() method. 24 Feb 2007 Amended Popup details to provide more information regarding POPUP 2. 15 Jan 2007 Amended File Picker and Popup patterns to include a 'Choose Null' button. Amended Output 2 to include the option of appending a line of accumulated totals and the end of the output. 18 Nov 2006 Amended File Picker, File Download and File Upload patterns by including some sample code. 26 Oct 2006 Added the ability to display a Version Number underneath the action bar. 18 Oct 2006 Amended Introduction to include a link to Radicore for PHP - Tutorial which documents the new procedure whereby new components can be generated by the framework at the touch of a button. 28 Aug 2006 Added Output 2 and Output 3 patterns. 12 Aug 2006 Added Output 1 pattern. 26 Jul 2006 Added File Download pattern. 14 Jul 2006 Added Timetable1 pattern. 15 Apr 2006 Updated Menu Bar to include a "logout (all)" option. 10 Mar 2006 Updated all details in "Object Calls" to refer to Functions, Methods and Variables. Added a template for Delete 4. 18 Dec 2005 Added a template for File Upload. Added Choosing which template to use. 11 Dec 2005 Added ERASE 1. 25 June 2005 Renamed MULTI 3 to MULTI 1 (for one table), MULTI 1 to MULTI 2 (for 2 tables), MULTI 2 to MULTI 3 (for 3 tables), and redefined MULTI 4. Also added LIST 3. 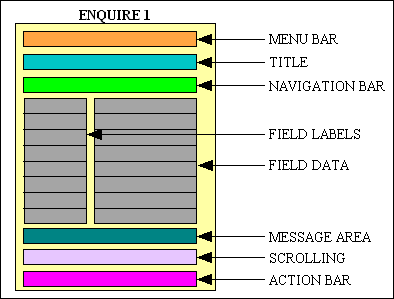 21 June 2005 Amended Data Area to show options which are available when constructing screen layouts. 08 May 2005 Added Multi 4. 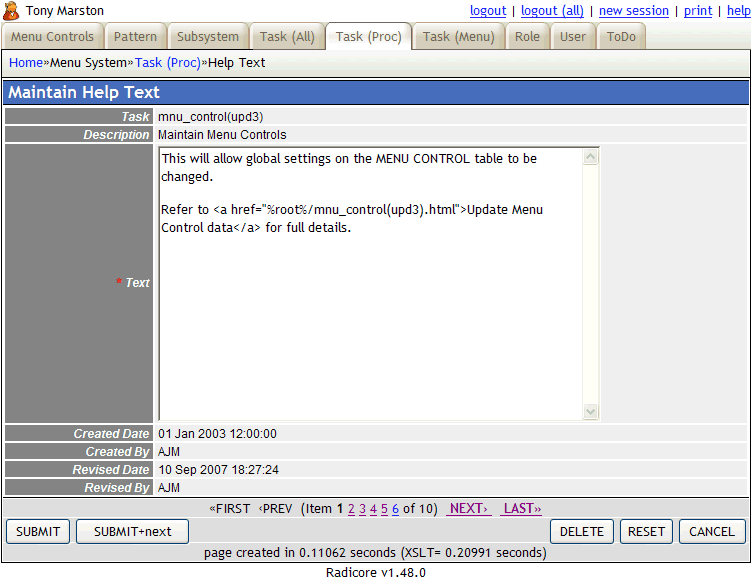 19 Dec 2004 Changed the contents of the action bar in ADD 1, ADD 2 and UPDATE 1 screens. 14 Nov 2004 Changed Popup screens so that when only a single selection is allowed the SELECT column will contain radio buttons instead of checkboxes. 01 Oct 2004 Added list of object calls to each template. 06 Jun 2004 Added sections for the Data Area and the Message Area. 28 Apr 2004 Re-styled all the page layouts. 22 Dec 2003 Added File Picker. 10 Nov 2003 Added Add 4, Multi 3, Update 3, Update 4 and Tree View 2. Added scrolling area to Delete 1, Enquire 1, List 2, Link 1, Multi 2 and Update 1. 23 Sep 2003 Added sample screen shots for all screens. 08 Sep 2003 Added new dialog types - Link 1, Multi 1 and Multi 2.